ShoeStores.com is all about footwear. We have been in the shoe business for over 130 years. Yes, you read that correctly, over a century plus a quarter. Today we are proud to offer our best customer service to patrons both online here at ShoeStores.com and in our shoe stores in the Indianapolis, IN area. For more information about the 130+ history of Stout's Footwear, visit our history page. Stout’s Footwear, the oldest shoe store in the United States and our parent company, proudly opened its doors to the world of ecommerce in 2009. Since starting ShoeStores.com, we have devoted our energy to providing personable and knowledgable customer service with quick free shipping to every customer. Excellent customer service is the standard of Stout’s Footwear and ShoeStores.com that will not be compromised. Our goal is to make sure that your demands of quality, style and comfort are fulfilled. Style, comfort and quality are the focus of the ShoeStores.com buying team. The brands we carry are a reflection of our values which is why we search the world for the finest footwear every season. We know that if you don’t take care of your feet then your whole body suffers. Brands such as New Balance, Munro, Ecco, KEEN, Birkenstock, Mephisto, and Sorel epitomize what we are about. Top-quality styles that are crafted with support, style and exquisite materials. As a bonus every ShoeStores.com order is delivered free of charge and with free return shipping too. Yes! We offer free shipping on all orders! You never pay a dime to have your order shipped via standard shipping. In addition, all ShoeStores.com orders are eligible for free return shipping. For more information about ShoeStores.com shipping and returns, see our shipping & returns info page. Returns are easy and free at ShoeStores.com! Simply visit ShoeStores.com/returns and provide your order number & ZIP code and you will be provided with a prepaid printable return shipping label. All refunds are processed within 1 business day of the package being received back at the ShoeStores.com returns location. For more information regarding returns, see our shipping and returns info page. All orders will ship the following business day after the order is placed unless noted on the product page for a particular item. Standard free shipping orders will deliver via UPS Ground, UPS Surepost, or USPS Priority Mail. You can expect delivery of your order within 2-6 business days when free shipping is selected. Please note that ShoeStores.com does not ship orders on Saturday or Sunday. ShoeStores.com does not accept exchanges at this time. To order a replacement pair of shoes, please do so online, chat, or call our customer service telephone at 1-888-318-8376. Can I return / exchange my ShoeStores.com order in a store? Yes, you may visit a Stout's Footwear location in Indianapolis to return or exchange your order. Click here to find your nearest Stout's Footwear shoe store location. Can I call customer service and speak with a real person? We pride ourselves on personable customer service. You can expect to speak with a US-based customer service agent when you call. You can also contact us via email or chat. For more information about contacting ShoeStores.com customer service, see our contact us page. We sure do. Click here to learn more about the ShoeStores.com 105% Price Match Promise. I'm a first time customer. How do I order? Welcome to ShoeStores.com! Placing an order with us is fast, simple, and completely secure. Just search or browse our site to find an item you want to order and add it your shopping cart by clicking the "Add to Cart" button on the product page. You'll be taken to your shopping cart where you can checkout by clicking the "Proceed to Checkout" button. Payment can be made by Visa, MasterCard, American Express, Discover, PayPal, or AmazonPay. If you prefer, you can also place your order over the phone by calling us at 1-888-318-8376. Note: Because it's not secure to transmit credit card information via email or chat, we cannot accept orders by email or our customer service chat system. My credit card won't go through. What's wrong? ShoeStores.com has takes security and fraud very seriously. Therefore, your credit card will not be accepted if the billing name and address does not match the information on file with your bank. We also require that the security code matches exactly. If your bank does not support AVS or CVV security features then your card may be declined. If you are having issues with a card then you may want to consider double checking the accuracy of the billing information you entered during the checkout process or perhaps try a different payment method. If you have questions regarding a transaction or credit card issue then please give us a call at 1-888-318-8376. What payment options do I have at ShoeStores.com? We want your shopping experience to be safe, reliable, and easy. This is why we offer a wide variety of payment options. PayPal: Pay using your PayPal account. AmazonPay: Pay using your payment methods that you have stored within your Amazon account without sharing any payment info with ShoeStores.com. How long does it take to for me to get a refund? Returns are processed within 1 business day of ShoeStores.com receiving the return package at our returns location. It may take your bank 1-3 business days before the refunded funds to settle into your account. ShoeStores.com only ships orders within the United States. I don't see my size on the product page. Why? If you don't see the size you need as available on the size drop down on the product page then that size is currently out of stock. Feel free to contact customer service to see if we can get you a pair of to see if more stock is scheduled to arrive soon. We are always happy to help locate an item for you. For more information on contacting customer service, visit our contact us page. I am not familiar with Euopean sizing. Can you help me find my size? For more information on sizing, visit the shoe size guide. Do you carry a specific brand / color / size / width? View all of the brands that we currently carry by visiting our brands page. From the brands page you can select the brand that interests you and then filter your search down to size and widths. I am not familar with shoe widths. Can you help me find my width? For more information on shoe widths, visit our shoe widths explained blog post. What can I do if I have a question or need assistance with the website? Get in touch with our US-based customer service team! We are happy to help you and answer any shoe or website related questions that you may have. We are available via email, phone, and Live Chat. For information on how to get in touch with our team, visit our contact us page. Is ShoeStores.com a part of Stout's Footwear? Yes! Stout's Footwear is the parent company of ShoeStores.com. We have 4 shoe Stout's Footwear stores plus New Balance Carmel in the Indianapolis, IN area. If you are looking for more information regarding Stout's Footwear, visit stoutsfootwear.com. 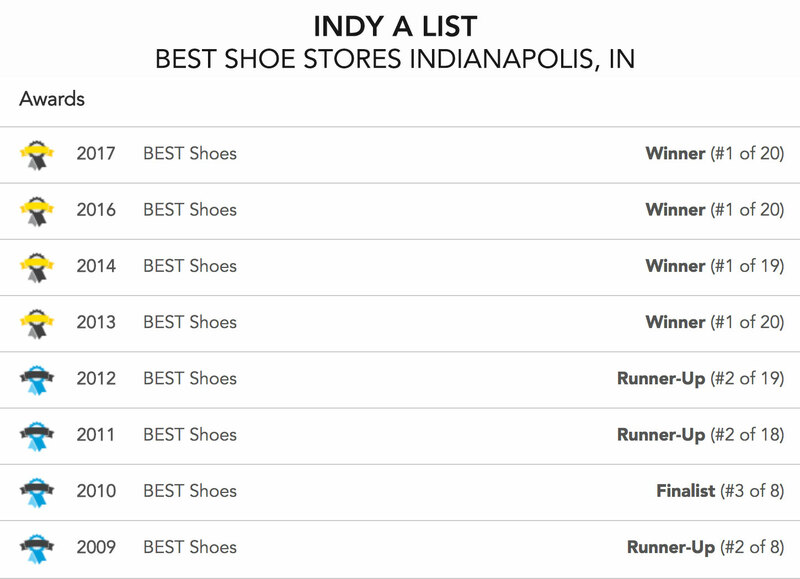 Our physical shoe store locations are all within the Indianapolis, IN area. Click here to find the location that is nearest to you! Can I filter products to just show my size and/or width? Yes! We try to make your online shopping experience as simple as possible. When you are on a brand or category page you can use the filters to narrow the results to only the sizes and widths you need. Does ShoeStores.com have a blog? Yes! Click here to keep up with the latest footwear news and info at the ShoeStores.com blog. ShoeStores.com does not print paper catalogs. Our product listings are constantly changing. Check out ShoeStores.com anytime to shop the entire catalog online. Yes! You can reach a customer service agent via chat by using the chat tool at the bottom of your screen. If no agents are available then you can leave a message that we will reply to within 24 hours. We would love to hear what you think of the shoes you ordered! Visit the product page, select reviews, and click "LEAVE A REVIEW." You may only review products that you have purchased. How do I know if an item will soon go on sale? ShoeStores.com is constantly keeping an eye on prices around the web and keeping the lowest possible price for our entire catalog. Unfortunately, we do not know if an item will go on sale until it actually happens. It is possible that different colors of the same style will be priced differently. Pricing depends on factors such as vendor restrictions, discontinuation of styles, and seasonal changes. How do you pick which brands you carry? Our buying team shops the world to find the best brands. The ShoeStores.com buying group makes sure that we always are fully stocked with quality brands that offer wide selections of sizes and widths. We demand excellent build quality and always bring in the hottest styles from our best selling brands. You need to enable cookies on your browser to enjoy all the shopping features on ShoeStores.com. Cookies need to be enabled on your browser so you can add products to your shopping cart and to access your account information. If you share your computer with others and you do not want them to have access to your account information, be sure to log out before leaving your computer unattended. You can log out by clicking on "Logout" link at the top of the page. ShoeStores.com takes great care and pride in offering a secure, safe, and private online shoppng experience. We never share any of your information with anyone. Norton Shopping Guarantee: The presence of the Norton Shopping Guarantee seal indicates that this merchant's identity, reputation, experience, financial stability, and ability to honor their sales terms and conditions have been inspected and verified. The merchant is monitored daily to ensure they always deliver on their terms of sale, thus assuring you a safe online shopping experience. Sitewide HTTPS encryption: Hyper Text Transfer Protocol Secure (HTTPS) is the secure version of HTTP, the protocol over which data is sent between your browser and the website that you are connected to. The 'S' at the end of HTTPS stands for 'Secure'. It means all communications between your browser and the website are encrypted. Trusted payment processing: All ShoeStores.com credit card payments are processed by Braintree a PayPal service. Use of a trusted, reliable payment processing service ensures that your payment information stays secure.